Visualization in Medicine is the first book on visualization and its application to problems in medical diagnosis, education, and treatment. The book describes the algorithms, the applications and their validation (how reliable are the results? ), and the clinical evaluation of the applications (are the techniques useful?). 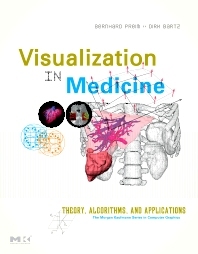 It discusses visualization techniques from research literature as well as the compromises required to solve practical clinical problems. The book covers image acquisition, image analysis, and interaction techniques designed to explore and analyze the data. The final chapter shows how visualization is used for planning liver surgery, one of the most demanding surgical disciplines. The book is based on several years of the authors' teaching and research experience. Both authors have initiated and lead a variety of interdisciplinary projects involving computer scientists and medical doctors, primarily radiologists and surgeons. Research physicians and scientists in visualization and computer-assisted radiology and surgery; graduate students in visualization and medical imaging; software and algorithm developers in medical imaging companies, such as GE, Siemens Medical Solutions, Philips Medical, Toshiba, and Tiani; developers in visualization companies, such as IBM, Mercury, Vaytec, Kitware, and Silicon Graphics. Bernhard Preim is Professor of Visualization in the Computer Science Department of the U of Magdeburg. He has given many tutorials on medical visualization at IEEE Visualization, Eurographics, EuroVis and Computer-Assisted Radiology and Surgery. He was founder of the German "Visual Computing in Medicine" group which has held two yearly workshops since 2003. Together with Charl Botha (Delft), he initiated the Eurographics Workshop series on “Visual Computing in Biology and Medicine”. Bernhard now heads the VCBM steering committee. Currently, Bernhard and Charl serve as editors for a special issue on “Visual Computing in Biology and Medicine” in the journal "Computers and Graphics". Recently, Bernhard Preim was invited to serve as associate editor of the premium journal IEEE Transactions on Medical Imaging. Bernhard is regularly Visiting Professor at Fraunhofer MEVIS and heads the scientific advisory board of ICCAS (Innovation Center Computer Assisted Surgery). In the German Society for Computer-Assisted Surgery he has been board member since 2007 and first Vice-President since 2009. Dirk Barz was Professor for Computer-Aided Surgery at the U of Leipzig. He was also member of the executive committee of the IEEE Visualization and Graphics Technical Committee. He received the NDI Young Investigator Award for his work on virtual endoscopy and intra-operative navigation.